The Agriculture, Livestock and Fishery Development Committee under the Union of Myanmar Federation of Chambers of Commerce and Industry (UMFCCI) will take charge of this agreement, which will take effect in May. Exporting rice to China will be the government’s top priority. The barter agreement comes after tonnes of Myanmar agricultural products, including rice, sugar and maize, had accumulated at warehouses near the border after China, in an attempt to crack down on illegal border trade, temporarily banned all imports from Myanmar. Since Chinese New Year in February, around one million bags of rice and 5000 head of cattle have been stuck in transit at Muse. As a result, rice prices have decreased by up to 20 yuan per bag, while breeders were forced to sell their cattle at low prices. In total, trade volumes have fallen by a value of US$650 million year-to-date in the current fiscal year compared to the year before, according to the MOC. China currently imports commodities based on a quota system. Myanmar’s official export quota, set in 2016, is 100,000 tonnes of rice. According to data from the MOC, over 50 percent of Myanmar-produced rice is sold to China via the border. As such traders are lobbying for that quota to be quadrupled, to 400,000 tonnes. Traders have expressed skepticism at the agreement though. “The MoU is just an initial phase,” said U Mike, a rice trader from Mandalay. He pointed out that Myanmar had signed several MoUs on trade with China in the past. Myanmar agricultural products, which up until now have been deemed illegal by China, will be costly if they are made official so it might be not profitable for traders and farmers in the early stages of the MoU, rice traders said. Although rice production in Myanmar hit its highest in 73 years last year, production is expected to taper this year as a result of declining demand in the Chinese market, which is the main buyer of Myanmar rice, according to rice traders. Rice is a main export of the country, generating over K5 trillion annually of which 40pc is generated by exports. As it plays a major role in the country’s economy, it is very important for rice producers to focus not only on the price but also on the quality, vice president U Henry Van Thio said at the Seminar for Development of Myanmar Rice and General Assembly and Annual General Meeting held by Myanmar Rice Federation on February 9. To protect cattle exporters to China from armed groups on the Muse road in Shan State, government authorities are considering opening a new route. U Aung Maung, deputy director general of the department, said officials are discussing the Bhamaw-Lwal Gel road as an alternative to the Muse road, where several armed groups have extorted money from exporters. Exporters have said that at least eight armed groups on the Muse road have demanded money from cattle exporters. They said China had offered to purchase 1500 head of cattle a day if they could be sent via the Bhamaw-Lwal Gel route. “There are illegal exports on the Bhamaw-Lwal Gel route. Making it an official cattle export route would likely curb the smuggling. The government said that 5833 companies exported 52,233 buffalos and 448,529 cows to China between December 2017 and March 15 2019. It said that 22,431 buffalos worth US$29.158 million (K44.37 billion), and 195,722 cows worth $234.865 were exported to China in fiscal 2018-19. The country has 9.62 million cows and 1.86 million buffalos, according to the latest count. The government has appointed U Aung Naing Oo as permanent secretary of the recently-created Ministry of Investment and Foreign Economic Relations, the official gazette announced. As the top civil servant leading the ministry, he will support and advise the cabinet minister, career diplomat U Thaung Tun, on how to drum up foreign investments and build on reform initiatives. Observers hope the new body will be the reflected voice of business in government, challenging line ministries on red tape while ensuring that related draft regulations are consulted on. U Aung Naing Oo was transferred to be director general of the Office of the Union Investment and Foreign Economic Relations on March 29. The civil servant is widely praised by the business community for drafting new laws and consulting stakeholders in an open and effective manner as director general of the Directorate of Investment and Company Administration (DICA). It is under his guidance that the 2016 Investment Law and 2017 Companies Law “achieved their intended outcome,” said Nishant Choudhary, co-chair of EuroCham Myanmar’s legal group. 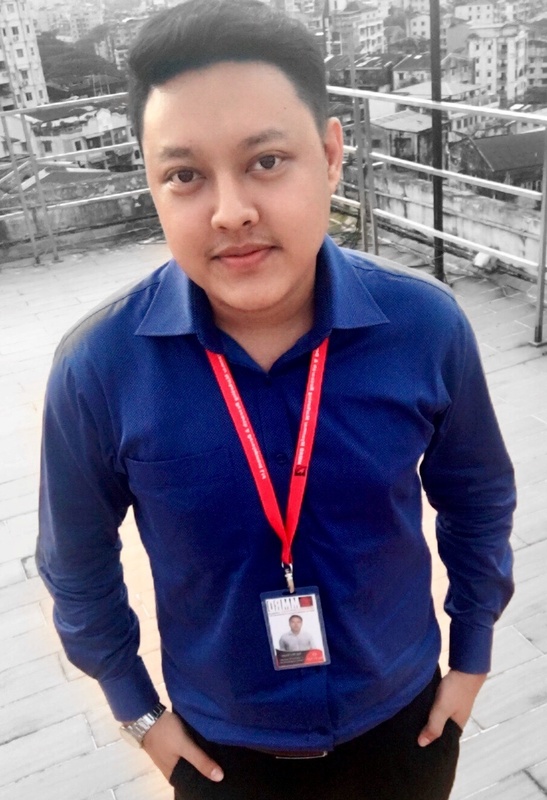 For Mandalay Technology managing director U Zaw Naing, U Aung Naing Oo’s “excellent leadership at DICA” has made a big difference for the private sector. “Business people in Myanmar see him as a key driver for corporate reform, including MyCo Online Register, the new electronic registry system, and the digitalisation of the investment application process. He will be able to make a bigger impact on economic reform in his new position, and brings with him a wealth of experience to support the minister,” the businessman commented. The investment ministry was established last November. Two departments formerly under the Ministry of Planning and Finance – DICA and the Foreign Economic Relations Department – were brought under the new body. The move represents Daw Aung San Suu Kyi’s belated efforts intended to win support for her much-criticised handling of the economy. The National League for Democracy-led government is facing huge challenges from its economic governance, especially in the implementation of new policies and laws, and investor confidence is further hampered by sluggish reform and the northern Rakhine crisis. From a peak of $9.4 billion in 2015-16, approved foreign investment has reduced to $6.6 billion in 2016-17 and $5.7 billion in 2017-18. A further $1.7 billion was recorded from April 1 to September 30, 2018, while in the 2018-19 fiscal year to March 15 it reached $1.9 billion. The country’s GDP is expected to grow by 6.6 percent in 2019 and 6.8pc in 2020, according to the Asian Development Bank. U Thaung Tun, who’s also the Myanmar Investment Commission chair, last November pledged to establish a “single-window” system for investment proposals, based on a list of standard operating procedures agreed on by relevant ministries. This is welcome by investors but yet to materialise. Many local businessmen, U Zaw Naing observed, are looking at how the government, including the new ministry, manages Belt and Road-related projects as well as investments from China. He is confident that the permanent secretary will work effectively with development partners, foreign governments and multilateral institutions to “mobilise external resources in order to assist Myanmar’s transition”. “I am certain that U Aung Naing Oo would further work towards improving the business landscape and regulatory environment,” Mr Choudhary added. U Thant Zin Lwin, who has been DICA deputy director general since 2016, is set to take over as DICA chief. The Union of Myanmar Chamber of Commerce and Industry (UMFCCI) and Mercosur-ASEAN Chamber of Commerce (MACC), which is based in Argentina and Indonesia, was signed the Memorandum of Understanding (MOU) at the UMFCCI office for trade and investment promotion in April, 2019. Representatives of MACC were from Argentina, Brazil, Paraguay and Uruguay branches and those branches were formed to conduct economic and political matters and the organisation is the one which is promoting the trade, investment and tourism sectors with ASEAN members. UMFCCI and MACC was signed to share economic information, to exchange data on economic laws, rules and policies, to promote economy and trade, to reduce economic sanctions and to exchange technologies and trainings, said Vice Chair of UMFCCI Dr. Maung Maung Lay. According to UMFCCI, cooperation for mutual interests in trade and investment in labour, legal, tourism and education sectors were discussed by representatives of MACC. The Ministry of Commerce (MOC) last month suspended 103 licenses to re-export sugar due to a lack of demand from China, said U Win Htay, deputy chair of the Myanmar Sugar and Sugarcane Related Products Merchant & Manufacturers Association. Out of 103 companies, 49 companies will have their trading registrations suspended for three months, while the remaining 54 companies, which have not been exporting will have their licenses suspended for up to six months. After an appeal was made by the Export Import Commercial Committee, the companies affected were allowed to continue operations until March 31. Checks will be subsequently conducted and the suspension enforced on those found without any export demand, the MOC said. Sugar trading companies have been unable to re-export sugar in recent months due to higher security measures at the Myanmar-China border, U Win Htay said. Many traders in Myanmar import and re-export sugar to China. The government in 2015 permitted the import of commodities such as sugar and diesel from Thailand and India for the purpose of re-exporting to meet high demand and boost local export income. Importing sugar also results in large quantities of foreign exchange (forex) leaving the country. Yet, the corresponding inflow of forex upon re-export does not match the outflow. Last year, this contributed to the depreciation of the Myanmar kyat versus the US dollar. Last August, the MOC also temporarily suspended re-exports of sugar in a successful bid to stabilise the falling kyat. 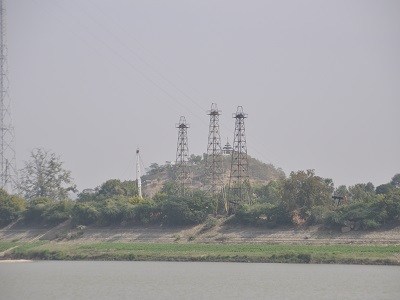 Investors in the Myotha Industrial Park Project, which is under implementation in Myingyan township, Mandalay Region, have profited from their shares in the project, U Tun Tun Aung, managing director of Mandalay-Myotha Industrial Development Public Company (MMID) told the media on March 29, just before the company’s fifth shareholders meeting. MMID has up to 1600 shareholders, of which 160 are local farmers. “We sold shares at K10,000 per share before. In last year’s meeting, we decided to divide each share into 10 shares so an investor who bought one share for K10,000 in the past could own 10 shares at K1,000. Over the last few years, we have paid dividends of up to 55 percent of the share value. Today, the price of per MMID over-the-counter (OTC) share is between K1300 and K1500,” U Tun Tun Aung said. MMID shares first started trading OTC on April 3, 2003. MMID paid out 10pc of its profits in dividends during the first annual shareholder meeting, 12.5pc in second annual meeting and issued bonus shares in the third annual meeting, he said. “A total of 7.9pc in profits were paid out this year. But we aim to further boost the share price value rather than distributing the profit. In addition, we will try to make an Initial Public Offering on the Yangon Stock Exchange,” U Tun Tun Aung said. 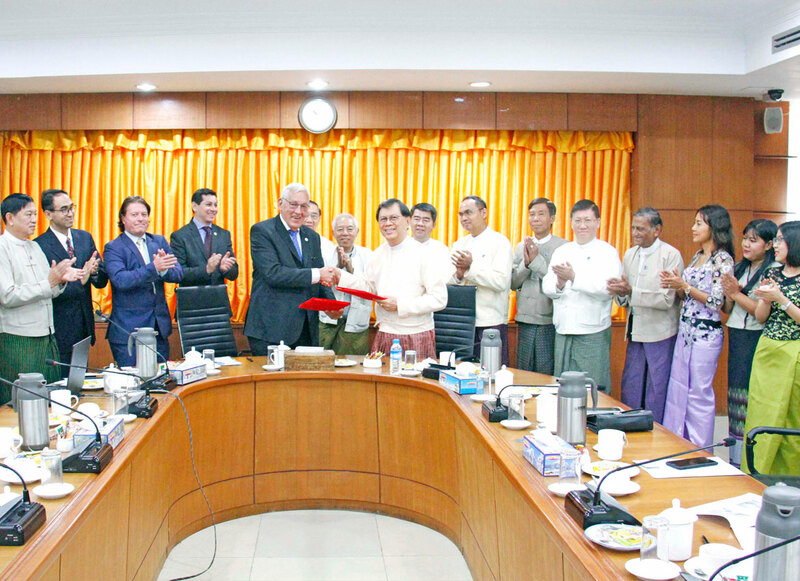 The Memorandum of Understanding (MoU) for MMID, Mandalay Region, was signed on December 9, 2011. It was permitted by the Myanmar Investment Commission (MIC) in November 2012. Development and construction work for the project first began in 2013 across 260,000 acres of land. Around 12,000 acres, or 4.6 percent of land space is being used by factories across several sectors to generate revenue. 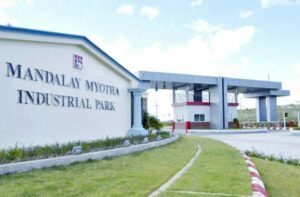 As of last year, there were seven international factories operating in the Mandalay Myotha Industrial Park. These include animal feed, plywood, snacks and concrete factories run by investors from Indonesia, Hong Kong, China and Denmark which have been approved by the Myanmar Investment Commission. Some local private investors have also set up shop in the area. “A Chinese car maker entered this year. They will have completed their installation process by April, and will start production in May. As fruits are abundant in Myanmar, a Japanese fruit-drying factory will also be opening up. I think the number of factories will increase to 20 in Myotha Industrial Park by this year or early next year,” said U Tun Tun Aung. Meanwhile, an international standard 18-hole golf course has also been completed in the industrial park. The Simikhone Port, which can load up to 50 tonnes of cargo, has been completed as well. Currently, local investments totaling K338 billion and foreign investments totaling K508 million have been channeled into Myotha, which is running with over 2500 staff. “We think we will be successful as the US and China are in a trade war and there are many problems in international community. As our country is stable we believe many investments will come to our country but no matter what project we do, we will need government’s support, encouragement and administration to be successful,” said MMID chair U Aung Win Khine at the fifth shareholders’ meeting. At the Mandalay International Commodities Expo and Economic Forum in third week of March, Mandalay Regional Chief Minister Dr Zaw Myint Maung highlighted Mandalay’s top five projects with the most potential for growth and development. These included the Myotha Project. Fuel prices are increased by Ks80 per liter in compared with the prices on February 12 due to the increase of global oil price, according to fuel stations. The fuel prices in local market on March 2019 were Ks775 per liter for 92 Ron, Ks870 per liter for 95 Ron, Ks965 per liter for diesel and Ks975 per liter for premium diesel. The fuel prices in local market on February 2019 were Ks695 per liter for 92 Ron, Ks790 per liter for 95 Ron, Ks885 per liter for diesel and Ks975 per liter for premium diesel. The global oil prices had significantly increased since the second week of October 2017 and reached US$73 per barrel on October 3, 2018. It is significantly higher compared with the oil price, which is around US$49 per barrel, in early August 2017. The global oil price was decreased to around US$42 per barrel on December 24 and increased again to around US$45 per barrel on January 1, around US$54 per barrel on January 21, around US$52 per barrel on January 29 and around US$57 per barrel on February 22. Local fuel price increased to over 21 percent within four-month time from June to October and the highest record of fuel prices were Ks1,065 per liter for 92 Ron, Ks1,115 per liter for 95 Ron, Ks1,095 per liter for diesel and Ks1,105 per liter for premium diesel on October 10 2018. On January 3, 2019, the fuel prices were decreased to Ks670 per liter for 92 Ron, Ks730 per liter for 95 Ron, Ks850 per liter for diesel and Ks855 per liter for premium diesel. Although exchange rates are gone down during January 2019, the fuel prices are increased from Ks25 to 60 per liter in January and up to Ks40 per liter in February. The fuel prices in local market on April 1, 2016 were Ks550 per liter for 92 Ron, Ks650 per liter for 95 Ron, Ks500 per liter for diesel and Ks540 per liter for premium diesel. They are increased to 94 per cent for 92 Ron, 72 per cent for 95 Ron, 119 per cent for diesel and 105 per cent for premium diesel in compared with the fuel prices on October 10, 2018. As part of ongoing efforts to liberalise the financial services industry and increase credit to the private sector, the Central Bank of Myanmar (CBM) has introduced regulations to facilitate foreign investment in domestic lenders. On January 29 the CBM issued Regulation No 1/2019, allowing foreign banks and financial institutions to hold equity of up to 35pc in local banks. To obtain approval from the CBM, a domestic lender will have to provide a copy of the agreement with the overseas institution along with the proposed equity ratio. It is hoped the change will enhance competition in the market, bring gains in lending and improve service quality. Prior to the reform, the Myanmar Companies Law, which came into force on August 1, 2018, made it possible for foreign investors to hold a minority stake of up to 35pc in domestic firms, although this had not yet been applied in practice in the banking sector as the CBM had maintained strict supervision. The move follows another significant step forward in the liberalisation of the financial services sector, with the Ministry of Planning and Finance (MoPF) announcing on January 2 that foreign companies could offer life and non-life insurance lines in Myanmar. In the same vein, the retail banking segment is set to open its doors to foreign participation next year, with U Soe Win, minister of the MoPF, stating in mid-January that the government will allow overseas firms to launch retail banking services in 2020. The bureau is aiming to develop the risk framework that banks use to make lending decisions, which are overwhelmingly based on secure collateral. The CBM’s policy of capping interest rates at 13pc – which meant lenders were not able to charge more for higher-risk clients and therefore often avoided providing credit – and strict collateral requirements have also been viewed as inhibiting private sector credit growth. However, the regulator recently moved to address this, giving banks permission to extend loans to clients at a maximum lending rate of 16pc for unsecured collateral as of February 1. Furthermore, clients will be able to apply for the rate with or without collateral. “This extra room in interest rates will be a boom for the sector and will make loans viable where before it was tough or impossible due to the previous secured collateral rules,” U Thein Zaw Tun, managing director of CB Bank, told OBG. The inauguration of the Mandalay International Trade Fair & Business Forum 2019 was held, at the Mandalay Convention Centre (MCC), Mandalay Region. The event took place with the aim of boosting trading sectors and investment enterprises in the region. Union Minister for Commerce Dr. Than Myint said in his opening speech that the purpose of holding the event was designed to gain commercial opportunities for all the business personnel in Mandalay and other places across the country, and efforts had been made to let the international community know about the event, as a symbol of stability and tranquility in our country. Moreover the event could foster sustainable development of Mandalay Region and which looked like a milestone of the economic development of the country. UMFCCI President U Zaw Min Win and Mandalay Region Chamber of Commerce and Industry (MRCCI) Chairman U Kyaw Min also addressed their opening remarks at the event. Then Mandalay Region Chief Minister Dr. Zaw Myint Maung presented a topic titled, “Mandalay Vision 2030” regarding investment opportunities in Mandalay. Next Union Ministers and attendees posed for documentary photographs together and observed the trade show booths at the event. In the afternoon, Secretary of the Myanmar Investment Commission and Director General of the Directorate of Investment and Company Administration U Aung Naing Oo discussed a topic titled, “Mandalay Beyond Horizon”, and answered the queries raised by the attendees. At the forum, there are totaling 269 booths, including cosmetic goods, electrical appliances and construction materials, that are being exhibited their products, together with discussions and business matching, till 25 March. On Tuesday, the State Counselor and Thai Prime Minister Prayut Chan-o-cha opened a new bridge linking Mae Sot district in Thailand’s Tak province with Myanmar’s border city of Myawaddy. A second Mae Sot Boundary Post was also opened alongside the bridge. Daw Aung San Suu Kyi said the bridge would promote cross-border trade, investment, tourism and cultural exchange. Bilateral trade between Myanmar and Thailand stood at US$5 billion (7.7 trillion kyats) in fiscal 2017-2018, $4.3 billion in 2016-17, $4.8 billion in 2015-16, $5.7 billion in 2014-15, $5.6 billion in 2013-14, $4.7 billion in 2012-13, and $4.5 billion in 2011-12, according to the Ministry of Commerce. Thailand is Myanmar’s third-biggest source of foreign investment. The bridge lies on the East-West Economic Corridor, part of the Mekong-Japan cooperation scheme, Tokyo’s grand infrastructure plan for the region. Within this plan, Myanmar sits on two major economic corridors: the East-West Economic Corridor connecting Vietnam’s Dong Ha City with Yangon’s Thilawa Special Economic Zone (SEZ) via Cambodia and Thailand, and the Southern Economic Corridor connecting central Vietnam, Cambodia and Thailand to the Dawei SEZ in southeastern Myanmar. The plan aims to improve connectivity between Bangkok and Yangon along the East-West Corridor. The corridor will help businesses based in Bangkok extend their supply chains to Yangon (at the Thilawa SEZ). The Myanmar section of the East-West Corridor does not yet function as an international highway due to bottlenecks such as one-way stretches, a lack of paved roads, traffic difficulties in the rainy season and weight limitations. According to the Japan International Cooperation Agency, Tokyo plans to shorten transport time by constructing three bridges in Karen and Mon states—the Gyaing-Kawkareik Bridge, the Gyaing-Zathabyin Bridge and the Atran Bridge—as part of the East-West Economic Corridor. These are expected to reduce the time needed to transport goods the 870 km from Thilawa to Bangkok to one-and-a-half days.